[June 5, 2017] Seattle City Council has just passed a tax on sugar-sweetened beverages. By passing this tax, Seattle is following the lead of seven other U.S. cities, but taking the lead in how the revenue will be spent: Seattle is the first city to invest sugary drink tax revenue into healthy food access for working families. In Seattle, some 122,000 households fall into the “food security gap”: they earn a living wage but are unable to afford healthy food due to the rising cost of rent and other expenses. These families’ incomes are at 200 percent of the poverty level, so they do not qualify for EBT/SNAP benefits. By collecting an additional .0175 cents for every ounce of any sugar-sweetened beverage sold in Seattle (excluding dairy, medical drinks and diet soda) the Sugary Beverage Tax could raise about $15 million per year. The majority of these funds will be used to help families access affordable, healthy food. In this way, the communities hit hardest by the tax will benefit the most. Got Green’s Food Access Team is made up of community members who fall into the food security gap. We advocate for access to healthy affordable food for working families. In partnership with 30 community organizations, the Food Access Team urged the City Council to dedicate at least one third of the Sugary Beverage Tax revenue to closing the food security gap. On May 26th, we delivered over 500 petition signatures to the City Council, in the form of a scroll extending across the length of the room. Community members testified about the importance of healthy foods in preventing obesity and diabetes. 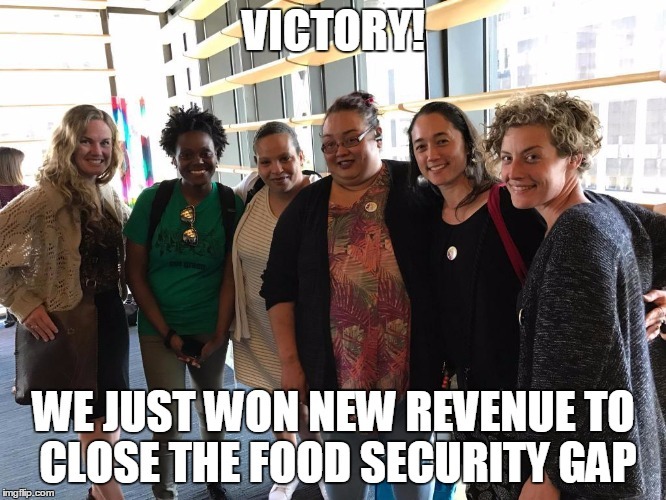 It worked: we secured a promise that at least 50 percent of the Sugary Beverage Tax revenue will be directed to food security. The funds will be used to grow the Fresh Bucks program — a dollar-to-dollar match program for EBT/SNAP users to purchase fruits and vegetables at Farmers Markets in Seattle and surrounding areas — and for programs aimed at closing the food security gap. Got Green is community organization based in South Seattle that organizes people of color and low-income people to achieve Green Justice for all. Got Green’s food access team is working to close the food security gap for low-income and working families in Seattle and beyond. Got Green helped win the Fresh Bucks program in Seattle, which is now being expanded to 18 counties across the state.